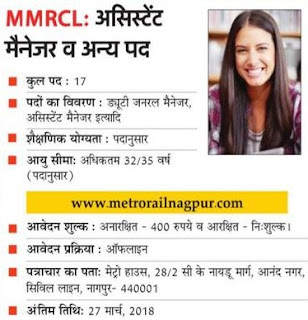 MMRCL Assistant Manager Recruitment 2018:- Application is invited to fill form of 17 posts in Metro Train Department. It is Direct Interview Process where candidate don’t even to give written exam but need to Interview Date. So if you have Reasonable qualification than kindly touch this notification by means of Goods (Attach Photo, Certificate and Rs 400) very soon to get jobs. MMRCL Deputy General Manager Recruitment 2018:- The online registration will remain active from 23rd February, 2018 to 22nd March, 2018. MMRCL will send intimation of personal interview and any other information regarding your application only through the registered E-mail ID. Age Limit of MMRCL 17 Manager Recruitment 2018 and other posts would be as on 01st February, 2018 have the below age limit. Minimum age: 18 yrs to not exceeding 35 years Maximum. Age is relaxable for deserving/ internal /deputation candidates. Selection Process: Candidates who were applying for this Metro rail Jobs in Mumbai Candidates applying for the posts mentioned in the advertisement will be called for Personal Interview Call Letter (Written Exam). Educational Qualification:- Must be a Graduate and MBA with specialization in Finance from a reputed Institute a Govt. recognized University. DMRC Application Fees: The fee will be accepted Offline by Posts in form of Demand draft and Challan. For more details Notification. For General, OBC applicant: Rs. 400/-. For SC, ST applicant: Rs. 0/-. Interview Admit Card of MMRCL AM Recruitment 2018:- After completing the application form by number of People Mumbai Metro issue admits cards in the category of Interview Call Letter which Will/are available on the official website. Candidates will get e-mail or message after the release of admit cards. Last date for fee payment with bank Challan : 27 March 2018. Interview Call Letter:- April 2018. How to Apply:- Candidates should login to the official website and download the Notification of Metro Rail Mumbai Recruitment 2018. Then Blue pen fill the form for the relevant post using the given link. MMRCL Assistant Manager Result 2018:- This process is come after getting offer letter from Mumbai Metro Board. Results will be announced on our sscbankgk. In site upcoming.